GOLD INVESTMENT bars pushed their New Year 2018 gains to 2.3% versus a falling Dollar in London trade Friday, rising even as world stock markets extended yesterday's fresh record highs in US equities. 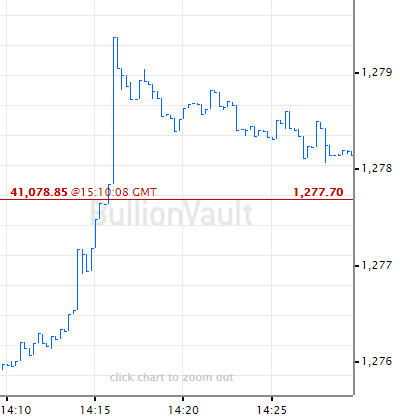 Large bullion bars traded by wholesalers and investment dealers reached new 4-month highs at $1332 per ounce before edging back after new data said US inflation in consumer prices held firmer than expected in December. The official CPI index rose 2.1% from 12 months before, with so-called "core" prices rising 1.8% from November's 1.7% annual pace. Platinum prices outpaced gold yet again, adding 7.3% for 2018 to date to touch 17-week highs just $4 shy of the $1000 mark. But silver lagged badly, trading lower for the week even against the US Dollar. "No doubt stretched shorts instigated over the past fortnight are playing a role in the [gold] price gain," says the latest trading note from Swiss refiners MKS Pamp, pointing to speculative trading in Comex futures and options contracts, rather than physical bullion. "[A] test [of] the recent high of $1357 (September 2017) will see further aggressive short covering." 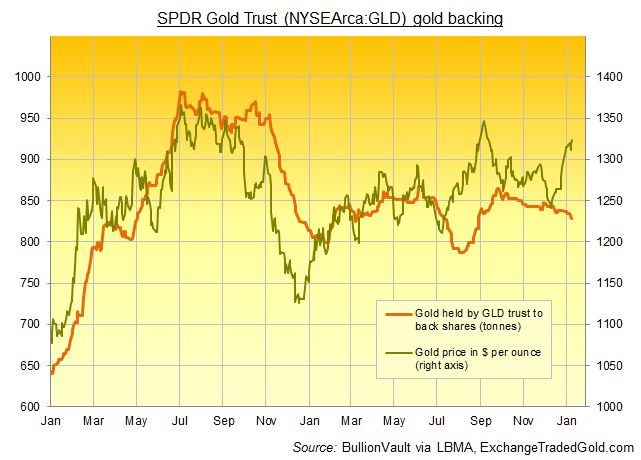 Amongst gold-backed trust funds, the giant SPDR Gold Trust (NYSEArca:GLD) ended Thursday unchanged in size even as the share price rose with the cost of bullion. Thanks to shareholders liquidating the GLD – a major proxy for investment funds wanting to track the gold price – it has now shrunk 1.6% since bullion bottomed at 5-month lows immediately before the US Fed's December rate rise. 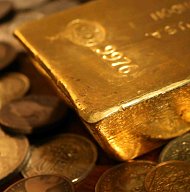 Investment gold prices have in contrast gained 7.6% for Dollar buyers. The GLD was last this small in late-August. Gold prices were also then rising through $1330 per ounce. The single Euro currency meantime rose Friday to new 3-year highs above $1.21. That pushed gold investing prices in Euro terms back down to unchanged for the week at €1098 per ounce. Yen gold prices stood 1.0% lower from last Friday's 30-month peak as the Japanese currency rose to 6-week highs versus the Dollar on the FX market. "Most Western commentators do not give developments in Japan as much attention as it deserves," says the latest Global Strategy note from perma-bear Albert Edwards at French investment bank Societe Generale. 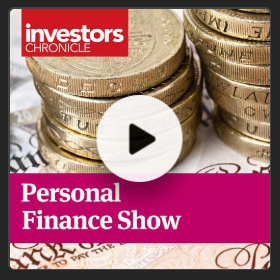 "Could it be that a surprise monetary tightening in Japan will finally burst the global asset price bubble? It is now entirely conceivable that the improved economic and inflation picture...prompts [the Bank of Japan to cut its QE]...leaving the market badly wrong-footed and prompting a massive 2008-like unwind." Having bucked the trend of gaining versus the Dollar all week, the Chinese Yuan also jumped overnight Friday, hitting its strongest level versus the US currency since September's spike to 18-month highs. 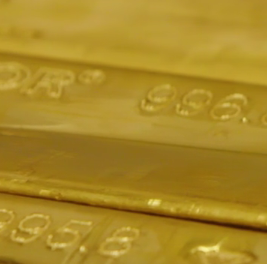 Priced in the Yuan, Shanghai gold rose only one-third as fast as global Dollar quotes for investment-grade bullion. That squashed the Shanghai premium back below $8 per ounce, holding this week's average incentive for new imports to the world's No.1 consumer nation almost 20% below typical levels. "Physical interest out of Asia continues to remain muted," says MKS Pamp. "Rather, the metal continues to remain bid on the back of a weaker greenback. After China's factory-gate inflation slowed only to 4.9% per annum in December, stronger than analysts forecast, US producer prices showed their first month-on-month decline in a year on Thursday's new data, pulling the annual rate of inflation down to 2.6%.